W.B. 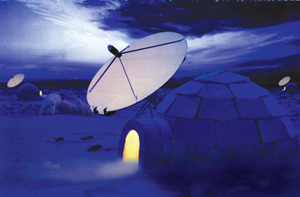 Walton Enterprises designs and manufactures a line of equipment that prevents the accumulation of snow and ice on satellite earth station antennas. The company was founded in 1946 by William Walton, Sr. originally to do electrical contract work for companies like Western Union, RCA and Comsat. In 1979, William Walton, Jr., present President and Owner, took on the considerable challenge of fighting the harsher elements of weather that affect satellite communications. Since then, W.B. Walton has become the leading satellite company in providing quality products protecting earth stations during poor weather conditions. Early de-icing products designed by W.B. Walton Enterprises include a behind the antenna heated system for antennas ranging from 3.7 to 32 meters in size that are still sold today. More recently, a line of de-icing products called the Snow Shield was designed and manufactured for antennas ranging from 0.6 to 6.3 meters in size using a PTFE Coated Fabric stretched over the satellite antenna. This system can include automatic heating and remote activation & monitoring. With decades of field-proven worldwide customer support experience and customer-service orientation, W.B. Walton Enterprises is committed to providing products of the best quality backed by superior customer service and support. We offer turnkey integration, installation, maintenance and tech support. W.B. Walton products, including our original, patented, and patent-pending technologies are designed manufactured with pride in the U.S.A.